To use a living roof for evaporative cooling, assisting temperature control in the cool store for cost savings on heating and cooling. To use the living roof for waste water treatment and purification. To demonstrate that Mt Difficulty is environmentally conscious. 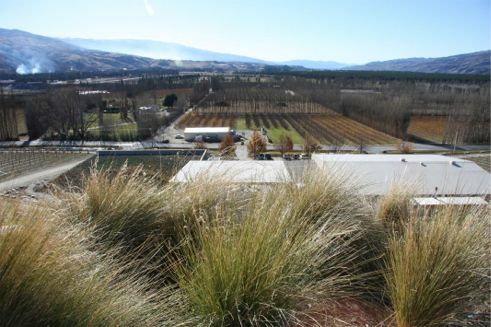 To create a living roof which fits in with the specific Central Otago location, utilising native and exotic plant species found in the local area. To complement the beautiful Central Otago outlook from Mt Difficulty's delicious restaurant and tasting room. To provide economic, environmental and social benefits. Comments: New Zealand’s Central Otago Pinot Noir is a world renowned and Mt Difficulty Wines regularly feature on distinguished wine lists. Due to the increasing popularity of their wine, Mt Difficulty have scaled up their boutique winery to cope with the demand. In an effort to cater for the larger volumes of wine, a new barrel store was built. The brief for the new barrel store in Bannockburn, Cromwell, New Zealand was to create a temperature controlled and environmentally conscious space that would fit into the surrounding Central Otago landscape. Winemaker and General Manager of Mt Difficulty wines, Matt Dicey worked alongside Wild Rooster Design to develop a design to fit the brief. The resulting building is an earth toned exposed aggregate pre-cast panel construction buried back into the hillside with a vegetated "living roof" covering the entire 900m2 roof footprint. Temperature control is a vital component of wine making and was a key factor in the design. Matt Dicey comments "in many ways the design revolved around the functionality of the space”. To keep the temperature correct and constant for wine making, the building is set into the earth hillside at the back sides and has a 150mm deep vegetated roof installed on the insulated slab roof. By spending a bit more money at the start on the design and construction, Mt Difficulty will end up saving a lot on heating and cooling costs. Stormwater360 New Zealand was commissioned to carry out the design and installation of the living roof. Using the LiveRoof pre-vegetated modular system, Stormwater360 contracted a local grower to propagate and grow the 4800 modules. Modules were planted by Central Otago Property Services with a mix of local native grasses, wild thyme and locally sourced stonecrop sedum. Stormwater360 designer Greg Yeoman discussed the design "the brief was to incorporate local grasses and stonecrop sedum. From this we developed a palette of grasses suited to the lightweight pumice based growing medium and mixed in locally sourced thyme for aromatics and sedum for colour ". The resulting design interacts with the surrounding hillside where 4,000+ native plants and trees are being re-established as part of the development. The flowing lines of the plant groupings emulate the hill contours. The dramatic hillside is a beautiful backdrop with scarred sluice marks from the old gold rush days and rugged central Otago grasses. Installation of the living roof was completed 30th March 2012 and due to ease of installation of the pre-vegetated modular system took 4 days to complete. The roof can be viewed looking down from the Mt Difficulty restaurant and tasting room while enjoying a glass your favourite wine.